Harsh “skipe” call given when flushed. 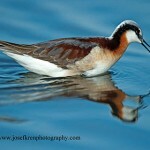 On breeding grounds gives “wheet-wheet” notes. Description: Sexes similar. A stocky bird with short legs and a long yellowish bill. Strongly striped head pattern. Mottled brown above; white below with barring on flanks and vertical streaking on throat and breast. Rusty tail. Distinctive rapid zigzagging flight when flushed. 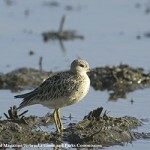 Habitat: Marshes and other wetlands with areas of mudflats or mucky soil. Shoreline and emergent vegetation is preferred over more open areas. 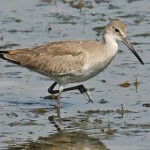 Where in Nebraska: Common spring and fall migrant, and rare summer resident. Regular breeder in wet meadows in northern 2/3rds of the state. Overwinters in small numbers in unfrozen seep springs, especially in eastern Sandhills. Field Notes: Usually only seen in flight or when flushed. 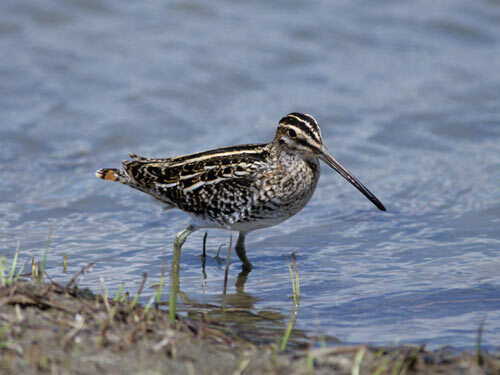 Fun Facts: The long bill of the Common Snipe is flexible, with sensory pits at the tip of the bill to be able to feel its prey in the mud.